November sales declined 3% to $98,612,691 vs. October at $101,712,163. This was 1% better than last year at $97,179,181 (even with the tax incentive expiration). The twelve month moving average line on the total dollar sales chart is still poking up a bit. Total unit sales decreased to 639 in November vs. 651 in October a decrease of 12. New sales increased to138 homes this month vs. 125 last month, an increase of 13. Used sales decreased to 501 homes this month vs. 526 last month, a decrease of 25 (Sect E p.3). Used inventory levels remain high this month at 13 months (see the chart Sect C p.1), with the situation particularly challenged in the higher price ranges. Used homes over $100,000 are still over 13 months of inventory and over $400,000 have two or more years of inventory. New home absorption is 9 months of inventory overall, (with last month at 11 months), (E-1). The New Home inventory level in the $300,000-$500,000 is approximately 6 months (not bad). There continue to be a large number ofhousingpermits issued in Huntsville city, given the market conditions. October decreased to 79 (imputed by the Census dept) vs. 87 in September (chart on the web site). Total Active listings decreased this month to 8,510 compared to last month’s 9,338, which is below last year at this time at 9,329 (Sect A p.4 and Sect E p.3). Active New listings decreased from 1,529 last month to 1,285 in November, down 244. (Sect E p.3). Active Used listings decreased from 7,809 last month to 7,225 this month, down 584 and below last year’s amount at this time of 7,829. (Sect E p.3). Average Days on Market for Sold New homes was 142 vs.160 days last month, with Used at 149 in November compared with 164 in October (Sect A p.18). Days on Market at or below 6 months, while the inventory numbers are way higher, indicates well priced homes are selling. Sellers, including bank owners, are not adjusting to the new price reality which contributes to inventory build-up. The Average price lines which were on a upwards slope for a while, turned down particularly for Used Homes. Prices for individual properties remain under pressure. We have been doing some work to see how well we can predict overall residential sales as much as a year or two in advance and have some very encouraging results. Call me if you would like to discuss. Dollar sales this month decreased 18% to $57,418,263 from October’s $69,628,961. This is 10% above November last year at $52,326,531 when sales were impacted by the oil spill and the tax credit expiration (Sect A p.2). 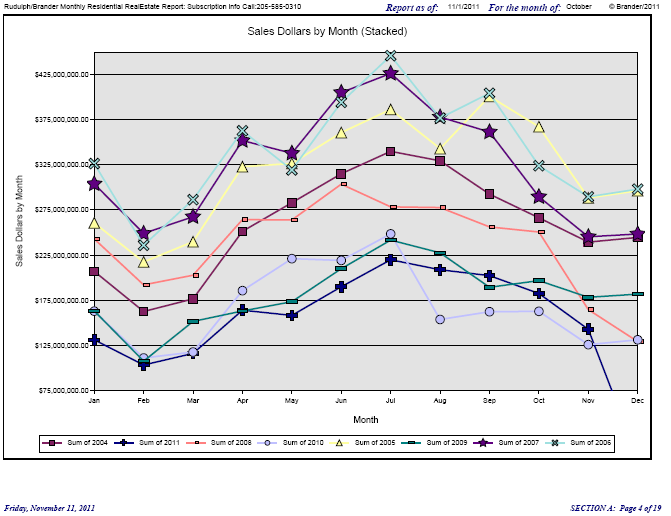 The 12 month moving average line of sales is quite clearly on an upwards tilt as mentioned last month. While inventories are high, unit sales have recovered to normal levels. Inventories in fact have declined quite dramatically. Dollar sales still lag reflecting fewer high end sales and lower prices. This situation is starting to reverse, with more high end homes selling. Still, it is unlikely that prices will increase for a while. On a unit basis, sales of all houses declined 7% to 315 this month vs. 339 last month, which is 15% up from last year’s 273. Used Home sales declined 5% to 296 this month vs. 311 last month, which is up 19% from last year’s 249 (Sect A p.18). New Home sales were 19 this month vs 28 last month. Low sales of New homes reflects intense competition from existing, and the shutdown of new construction. New listings for New homes decreased to 56 from 60 in October. Used houses New listings decreased to 499 from 565 in October with net inventory down. The absolute number of Used Active homes on the market, which had a slight peak mid-summer of ’09, has once again been improving. In November, there were 3,663 Active Used homes, a reduction from 4,018 in October. The New home market, which peaked in November 2006 at 2,144 Active, now sits at 342. The Absorption rate for New homes was 13 months of inventory for November vs. 14 in October. The Absorption rate for Used homes was 11 months of inventory for November vs. 12 in October. Over the last four years the drop in months of inventory for Used homes has been steady and impressive from 25 months plus in November 2008 to 11 months this November. Average sales price for all homes has been stable for the past year. For New units, prices increased to $219,064 from $177,908 last month. (Sect A p.14). Average Used home prices decreased to $179,919 from $207,870 in October. Average Days On Market for New Sold properties in November was 174 this month vs. 291 last month. Days On Market for Used was 190 this month vs. 182 last month. I found this article interesting in that it quantified what I have said before relative to how much of an impact residential investors had on the market. I suggest that you read the article on the site to see all the charts. The charts reveal some astonishing facts. At the peak of the boom in 2006, over a third of all U.S. home purchase lending was made to people who already owned at least one house. In the four states with the most pronounced housing cycles, the investor share was nearly half–45 percent. Investor shares roughly doubled between 2000 and 2006. While some of these loans went to borrowers with “just” two homes, the increase in percentage terms is largest among those owning three or more properties. In 2006, Arizona, California, Florida, and Nevada investors owning three or more properties were responsible for nearly 20 percent of originations, almost triple their share in 2000.
via “Flip This House”: Investor Speculation and the Housing Bubble – Liberty Street Economics. October sales declined 25% to $99,006,068 vs. September at $132,619,446. This was 9% worse than last year at $108,938,422 (even with the tax incentive expiration). The twelve month moving average line on the total dollar sales chart is still poking up a bit. Total unit sales decreased to 636 in October vs. 831 in September a decrease of 195. New sales decreased to117 homes this month vs. 164 last month, a decrease of 47. Used sales decreased to 519 homes this month vs. 667 last month, a decrease of 148 (Sect E p.3). Used inventory levels remain high this month at 14 months (see the chart Sect C p.1), with the situation particularly challenged in the higher price ranges. Used homes over $100,000 are still over 14 months of inventory and over $400,000 have two or more years of inventory. New home absorption is 9 months of inventory overall, (with last month at 11 months), (E-1). The New Home inventory level in the $300,000-$500,000 is approximately 6 months. There continue to be a large number ofhousingpermits issued in Huntsville city, given the market conditions. September increased to 87 (imputed by the Census dept) vs.97 in August (chart on the web site). Total Active listings decreased this month to 8,711 compared to last month’s 9,408, which is barely below last year at this time at 9,613 (Sect A p.4 and Sect E p.3). Active New listings decreased from 1,552 last month to 1,277 in October, down 275. (Sect E p.3). Active Used listings decreased from 7,856 last month to 7,434 this month, down 422 and below last year’s amount at this time of 8,117. (Sect E p.3). Average Days on Market for Sold New homes was 160 vs.152 days last month, with Used at 164 in October compared with 152 in September (Sect A p.18). Days on Market at or below 6 months, while the inventory numbers are way higher, indicates well priced homes are selling. Sellers, including bank owners, are not adjusting to the new price reality which contributes to inventory build-up. The Average price lines which were on a upwards slope for a while, turned down particularly for Used Homes. The fluctuation is mostly due to a changing mix of home sales with some more higher priced homes beginning to move as a proportion of the total market; prices for individual properties remain under pressure. Sales in October declined 22% to $142,502,706 from September’s $182,338,976, up 14% from last October’s $125,540,265. This month to month fluctuation is a somewhat larger seasonal contraction than normal. Keep the expiration of last year’s tax credit in mind when looking at year ago comparisons. The 12 month moving average line for total dollar sales remains tilted slightly upward. The following chart shows how each of the last few years stacks up on a monthly basis. Total unit sales were down 16% to 959 in October from 1,137 in September, a decrease of 178. This is a 27% improvement from October 2010 at 753. New sales declined 36% to 92 homes this month from 144 in September, a decrease of 52 units. Used sales declined 13% to 867 homes in October from 993 last month, a decrease of 126 (Sect E p.3). This month Total Inventory is lower at 10,860 vs. 13,286 last year. Active New listings decreased to 923 in October from 1,162 in September, a decline of 239 units (Sect E p.3).Forthethirdmonth, housingpermits showed a decrease in Jefferson County to 89 in September from 140 in August. Shelby County was up to 21 from 16 (see website for details). Absorption rate for New and Used homes last month remain high. New homes at 8 months supply this month and a reduced sales pace, is one month worse than last year at this time (Sect E p.3). The situation remains distressed. New home supply seems to be stable. Under $100,000 New homes are at 13 months supply. (Sect C p.1 and Sect E p.3.) New home inventories in higher price ranges (above $400,000), remain excessive at over a year. Absorption for Used homes in October 2011 shows 9,937 Used Active listings as a lower number than 12,036 last year (Sect E p.3), which is 11 months of supply, a bit better than 14 months last year (Sect E p.3). Birmingham area Average Days on Market for New houses was 207 compared to last month at 206 . 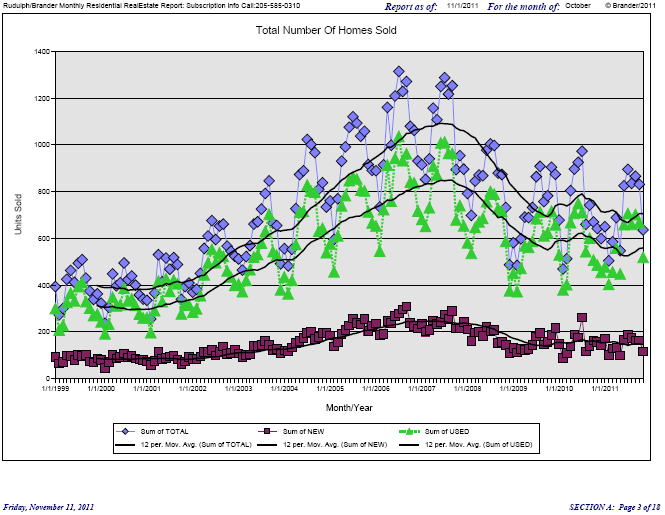 The Used homes DOM was 149 in October, compared with 149 last month (Sect A p.18). NOTE: DOM for Used Homes indicates that well priced homes are moving in less than 6 months. The high months of inventory indicates that sellers, including bank owners, are still holding out for higher prices. Newsflash: If the home is not selling, reduce the price, particularly since we are in the slower sales season of the year. Average sales price for Sold New homes decreased to $220,857 from $222,602 last month (Sect A p2). Average sales prices for Sold Used homes decreased to $140,927 from $151,344 last month (Sect A p2). The twelve month moving average price line for Used Homes has been quite steady since mid 2009. Average Home prices, new and used, have stabilized (Sect A p2). This is mostly a reflection in the change of “mix” with more larger homes being sold, but the price of any specific home remains under pressure. By the way we have developed some interesting statistical data that appears to be highly predictive of the overall residential sales level a year or more in advance. Give me a call if you might like to discuss. He says that if new houses aren’t built soon in the U.S., there won’t be enough next year. Dollar sales this month decreased 15% to $75,465,744 from August’s $88,583,253. This is 25% above September last year at $60,594,052 when sales were impacted by the oil spill and the tax credit expiration (Sect A p.2). The 12 month moving average line of sales is quite clearly on an upwards tilt. Year to date sales are up 20% to $698,334,308 vs $584,097,053 last year. Unit sales are up 18% to 3,414 vs. 2,903 last year. On a 9 month basis only 2004 and 2005 exceeded this unit volume. While inventories are high, unit sales have recovered to normal levels. Dollar sales still lag reflecting fewer high end sales and lower prices. Given the inventory level it is unlikely that prices will see much recovery for a while. For the last year, the twelve month moving average line of dollar sales is trending up. On a unit basis, sales of all houses declined 13% to 364 this month vs. 418 last month, which is 31% up from last year’s 277. Used Home sales declined 15% to 331 this month vs. 390 last month, which is up 35% from last year’s 245 (Sect A p.18). New Home sales were 33 this month vs 28 last month. Low sales of New homes reflects intense competition from existing, and the shutdown of new construction. New listings for new homes increased to 42 from 66 in August. Used houses New listings decreased to 526 from 683 in August with net inventory still down. The absolute number of Used Active homes on the market, which had a slight peak mid-summer of ’09, has once again been improving. In September, there were 3,884 Active Used homes, a reduction from 4,391 in August. The New home market, which peaked in September 2006 at 2,144 Active, now sits at 334. The Absorption rate for new homes was 13 months of inventory for September vs. 14 in August. The Absorption rate for used homes was 12 months of inventory for September vs. 14 in August. Over the last four years the drop in months of inventory for used homes has been steady and impressive from 25 months plus in September 2008 to 12 months in September. Average sales price for all homes has been stable for the past year. For New units, prices decreased to $179,069 from $298,172 last month. (Sect A p.14). Average Used home prices increased to $210,140 from $205,729 in August. Average Days On Market for New Sold properties in September was 188 this month vs. 303 last month. Days On Market for Used was 167 this month vs. 178 last month.